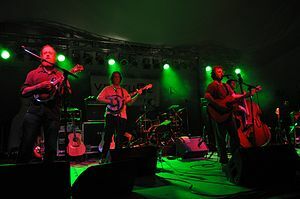 Railroad Earth is a bluegrass-influenced American band formed in Stillwater, New Jersey in 2001. 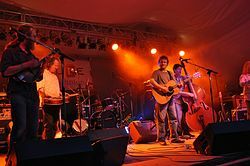 The band's music combines elements of progressive bluegrass, folk, rock, country, jazz, Celtic and other Americana influences. Recognized as "carrying on the tradition of improvisational, genre-spanning music laid forth by the Grateful Dead," Railroad Earth is known for lyrical songwriting and extensive live improvisation. The band takes its name from the Jack Kerouac prose poem "October in the Railroad Earth." The band also has a song of the same name. The six band members came together for the first time in January 2001. It was originally composed of vocalist/guitarist/songwriter Todd Sheaffer, violinist/vocalist Tim Carbone, mandolinist John Skehan, multi-instrumentalist Andy Goessling, drummer/vocalist Carey Harmon, and bassist Dave Von Dollen. Things kicked off with the six musicians working on a handful of original songs, mostly written by Sheaffer, the former From Good Homes songwriter, and began to realize that something musically unique was happening. After three weeks of rehearsing, they went into a local recording studio to track a five-song demo. Recorded live with no overdubs except backing vocals, this untitled demo set Railroad Earth's career in motion. Within a week, they landed a slot at Telluride Bluegrass Festival, an appearance that was only the new band's tenth as Railroad Earth. The previous nine gigs had been little more than warm-ups at small North Jersey bars and Elks lodges and a couple of support slots for regional bands. Realizing immediately how strong the initial five-song demo was, the band decided to return to the same studio to cut another five tracks to complete an album for release in time to debut at the Telluride Bluegrass Festival. In early April 2001, the band tracked another five songs, and The Black Bear Sessions was completed. It was released to the public in June 2001, just one week before their appearance at Telluride. That album contains what are still some of the most popular songs in Railroad Earth's repertoire, including "Seven Story Mountain," "Head" and, of course, "Railroad Earth." The band was approached by Sugar Hill Records after seeing their performance at Telluride. Right after their show, Railroad Earth was offered a record deal on the spot. In June 2002, Railroad Earth released its follow-up album on Sugar Hill titled Bird in a House, featuring such enduring songs as "Like A Buddha," "Mighty River," and the album's title track. Throughout that year Railroad Earth's touring schedule increased dramatically and their growing fanbase began to emerge as something tangible to promoters, radio stations and other media. They were garnering raves for their unique sound and exciting live shows and had become a staple act on the line-up of any roots, folk or jam-band festival. Their fans, who were now calling themselves "Hobos," began to grow quickly in size, and the venues were getting larger along with them. In late March 2003, Dave Von Dollen was replaced by Atlanta-based bassist Johnny Grubb. The following year, the band released its third studio effort, The Good Life, featuring "Storms," Mourning Flies," and "Goat." The band continued to tour throughout the country, and its first live album, Elko, was issued in late January 2006. They performed at the Austin City Limits Music Festival on September 15, 2007. The band's fourth studio album, titled Amen Corner, was released on June 10, 2008. The album features songs such as "Been Down This Road," "Hard Livin'," "Waggin' The Dog," and "Lovin' You." On November 11, 2009, Grubb announced his departure from the band after Railroad Earth's New Year's Eve run of shows in Portland, Oregon. In February 2010, Andrew Altman of the Codetalkers and Blueground Undergrass was named as his successor. The band's self-titled, fifth album was released on Oct 12, 2010. The album featured Andy Goessling, for the first time playing electric guitar, and new songs from Todd Sheaffer including "Jupiter and the 119" and " Too Much Information" plus an 11-minute instrumental, written by John Skehan, "Spring-Heeled Jack." It is the second longest studio track to date for the band. In February 2013 Railroad Earth performed at the Jefferson Theatre at the University of Virginia, and at Workplay in Birmingham, Alabama. On January 14, 2014, Railroad Earth released their seventh album, Last of the Outlaws, to rave reviews from media and fans alike. It featured the 21 minute long "suite" of "All That's Dead May Live Again" and "Face With a Hole" both written by Todd Sheaffer, and featured instrumental movements written by John Skehan In the tour that followed Railroad Earth headlined Red Rocks for the second time, selling out, and with the help of the Mile High Horns (arranged by Jay Rattman). The result can be seem on the DVD Live at Red Rocks. Railroad Earth backed Warren Haynes on February 3, 2015 for a taping of the PBS series Front and Center for airing in May 2015. There were also studio Haynes tracks recorded with Railroad Earth. The members of Railroad Earth have also released numerous solo albums. In 2009, Skehan released a duet album with mandolinist Todd Collins, performing the eighteenth-century Italian sonatas of Emanuele Barbella. In 2010 Carbone co-founded the jamband supergroup The Contribution with Keith Moseley and Jason Hann of String Cheese Incident along with Jeff Miller and Phil Ferlino of New Monsoon. Carbone has also produced albums by many bands, including Greensky Bluegrass and Great American Taxi. In 2015 Carbone contributed to Waywords and Meansigns, a collaborative project setting James Joyce's Finnegans Wake to music. Andy Goessling (born Andrew James Goessling on February 5, 1959) died of cancer on October 12, 2018, at age 59, as announced by the band. ^ a b "Railroad Earth On Mountain Stage". NPR.org. 24 January 2012. Retrieved 7 December 2018. ^ "Jack Kerouac's Octoberish magic". The Guardian. 19 October 2012. Retrieved 7 December 2018. ^ "October in the Railroad Earth [Full Text and Audio]". Sensitive Skin. Retrieved 7 December 2018. ^ "Railroad Earth chugs into Charlottesville". Cavalierdaily.com. Retrieved 14 October 2018. ^ "Bluegrass? Jamgrass? Whatever it is, Railroad Earth played it (music review)". Al.com. Retrieved 14 October 2018. ^ "Railroad Earth: Last of the Outlaws - Relix Media". Relix.com. 10 January 2014. Retrieved 14 October 2018. ^ "Warren Haynes & Railroad Earth Front & Center TV Taping". Jambase.com. 29 January 2015. Retrieved 14 October 2018. ^ "John Skehan and Todd Collins perform mandolin duets of Emanuele Barbella". Jambands.com. Retrieved 2015-04-27. ^ "The Contribution: Carbone, Miller, Moseley, Hann, Ferlino". Jambase.com. Retrieved 2015-04-27. ^ "Tim Carbone: Producer Serving the Song". Jambands.com. Retrieved 2015-04-27. ^ "Jam Bands, Experimental Music, and James Joyce". Gratefulweb.com. Retrieved 2015-04-27. ^ "Railroad Earth: In Loving Memory of Our Friend, Family, and Bandmate Andy Goessling". 18 October 2018. Retrieved 21 October 2018. ^ "In Memory of Andrew James Goessling 1959 - 2018". October 2018. Retrieved 21 October 2018.